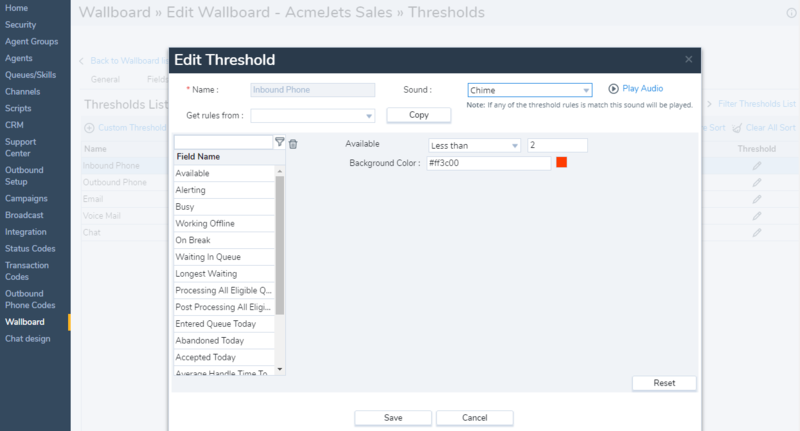 The next step in configuring a wallboard is to set up thresholds which alert you in the event of potential or actual slips in the performance. You can set up audio and visual alerts and vary the alert type based on the severity of the situation. For example, you can set up a threshold alert to monitor service levels of your contact center. If the performance of a skill/queue falls below the set SLA, you set up an alert so you can look at the activity level of agents belonging to the queue, identify areas for improvement and act quickly to recover. Or you can set up a threshold to monitor the waiting time for interactions. If the waiting time in a queue exceeds a certain time, the threshold alert can trigger. You can define thresholds for each media type and configure custom thresholds for each skill. In the Threshold tab, select media type, for example InPhone. From the list of fields, select a field. To specify a threshold value, enter the required parameters/arguments.